To me hair plays an important part in our daily lives. If I have a bad hair day, my mood will be affected the whole day. Likewise, if I’m having a good hair day, I will happy all day long! Thanks Calista and PHS Hair Science for the arrangement I managed to experience the luxurious spa treatment at PHS Hair Science Plaza Singapure branch. 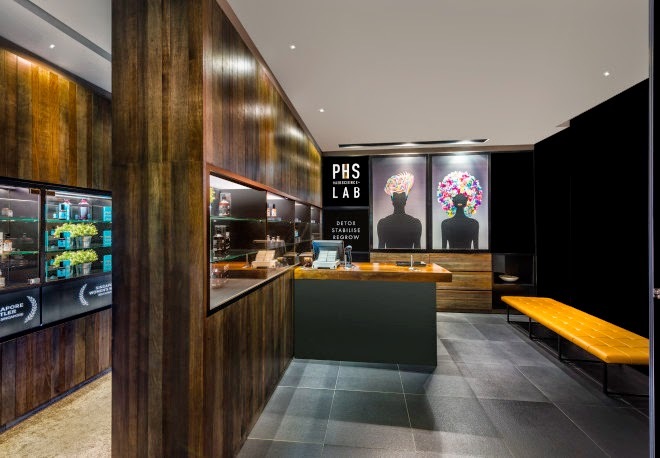 PHS (Professional Holistic Solutions) Hair Science is a revolutionary new concept in hair and scalp treatments. They combine the wonders of nature with the latest advancements in technology and research to come up with the best treatments for hair and scalp problems. They believe that most scalp and hair problems can be cured – not only through the use of effective products, but through proper consultation and advice. 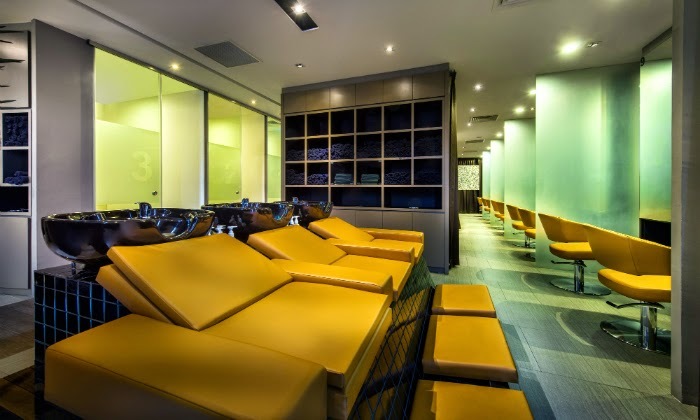 They have trichologist-trained consultants to analyse scalp conditions and customize detailed programmes for customers, based on their signature 3-steps DSR (Detox, Stabilise, and Regrow) programme. When I arrived that PHS PS branch, I was brought to the consultation room by Pauline. Pauline did a detailed check on my scalp condition and I also voiced to her what hair and scalp problems I faced. She used a handheld scanner to scan my scalp which it will magnify your scalp and pores. As you can see from the below pictures, these are my 4 serious hair areas. Very sensitive scalp which caused flakes, itchiness and redness. Mostly occurred on my hair line areas. Pauline told me these are not dandruff, the flakes are caused by dryness and sensitiveness of the scalp which usually happens around the hair line areas. She suggested me to use shampoo for sensitive scalp, she also suspected I may have mild eczema which causes the sensitive scalp as well. I didn’t know that! I always thought I have dry scalp so I keep on using shampoo for dry hair. Pauline introduced Purifying Scalp Spa Therapy to me. She said Purifying Scalp Spa Therapy is more suitable for my scalp compared to Detox Restorative Spa Therapy. Many thanks to Pauline, she’s very informative and knowledgeable about hair and scalp. I’ve gained a lot of hair & scalp knowledge from her and helped me to understand more about my scalp conditions. Now its time to enjoy the treatment! I was brought to the SPA room and Pauline introduced me to their hair therapist. 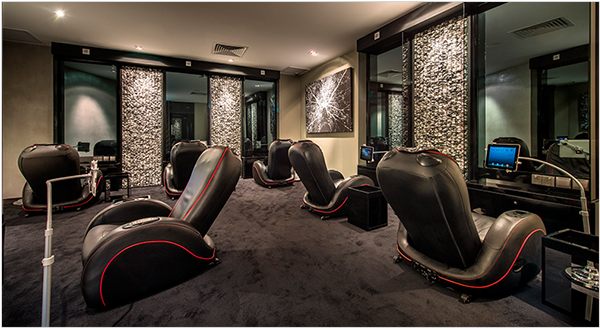 You can enjoy the massage chair & movies entertainment while doing the treatment. Superb! Indeed a luxurious spa experience! Changed into a more comfortable robe and bedroom slippers. A blanket to keep me warm as well. Time to pick a movie on the ipad, what should I watch?? Various type of tea/beverages for you to crunch your thirst. Purifying Scalp Spa Therapy is highly customised and tailored accordingly to remove build-up of oil, dirt, dead skin cells and restore the pH level of the scalp. Step 1: Therapist will start with applying the scaling lotion and a 5 mins head massage. This step is to removes oil, dirt and residue, clearing all clogged follicles, leaving your scalp rejuvenated. Step 2: Ten-minute Oxygen Therapy which facilitates microcirculation of blood supplies to the hair follicles. Apologies of the bad quality of my pictures due to the dark lighting, dim lights in the SPA room to keep us relax. Step 3: Hair Wash Time! 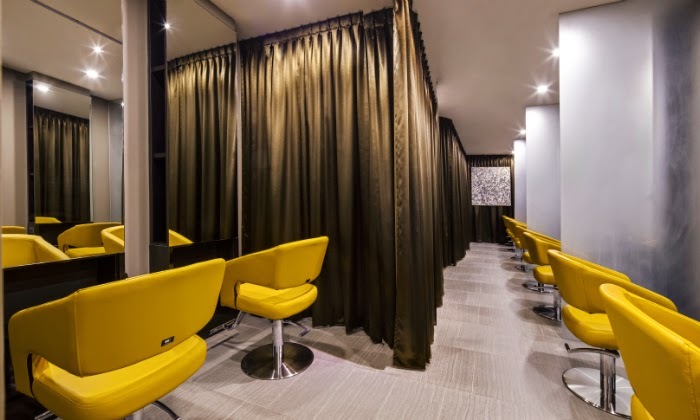 Hair wash area at Plaza Singapura branch. Comfortable and spacious shampoo beds/seats. Step 4: After the relaxing hair wash, I was treated with an indulgent ten-minute shoulder and neck massage. You get to pick your massage oil. I love Lavender! Step 5: My scalp was treated with the pH Balancing Lotion. Then followed by infra-red session for 10 minutes. Infra-red is to stimulate blood circulation and increase cellular nutrients supply to hair follicle. Step 6: 5 minutes scalp massage to relax your scalp and increase blood circulation. Step 7: Treatment ended with a blow and style of your hair, they make sure you leave PHS Hair Science with beautiful and healthy-looking hair. After the treatment, I was back to the consultation room with Pauline to check on my scalp condition. Most of the ares are clear of flakes, pores are cleaner and redness of my scalp are gone! With just 1 session, I can see so much improvements. Pauline said the scalp can be fully treated with a few more sessions. 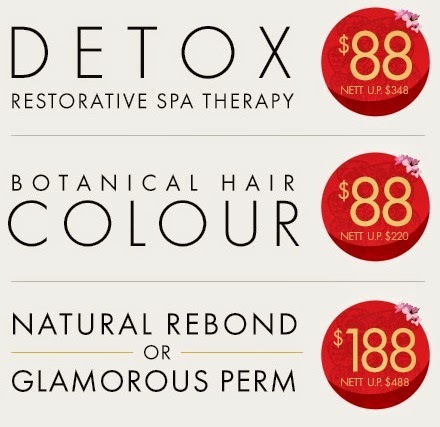 PHS Hair Science Purifying Scalp Spa Therapy (100 minutes) – $228 (excludes GST). 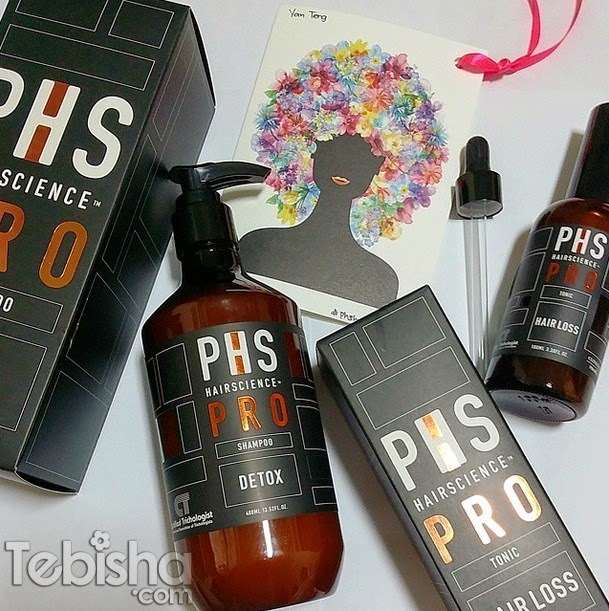 Besides Hair services, PHS Hair Science also launched Hair Products for customers and consumers which you can buy in stores or online (http://phshairscience.com/estore/). Using premium grade botanical ingredients, PHS Hair Science’s PRO Range Detox Shampoo thoroughly cleanses hair while restoring its natural balance. The shampoo contains moisturising extracts from rosemary that can revitalise and rejuvenate scalp, leaving hair tangle-free, static resistant and silky smooth with volume. The PRO Range Detox Shampoo delivers high performance results and allows hair to feel refresh and be able breathe again. Like all other PHS Hair Science trichology products, the PRO Range Detox Shampoo is developed and tested by trichologists for its efficacy. regular progress updates on scalp condition. Using premium grade ingredients, PHS Hair Science’s PRO Range Hair Loss Tonic reduces hair loss and revitalises hair and scalps for healthy growth. The revolutionary breakthrough tonic extends hair’s life cycle and promotes strong and constant hair growth by oxygenating and regenerating the hair bulb. It also inhibits the action of free radicals while increasing scalp circulation. The PRO Range Hair Loss Tonic delivers high performance results to maintain and preserve beautiful hair. It is ideal for treating various causes of hair loss including Telogen Effluvium (thinning hair) and Alopecia Areata (baldness). Like all other PHS Hair Science trichology products, the PRO Range Hair Loss Tonic is developed and tested by trichologists for its efficacy. Directions of use: Apply at least 20 sprays per application once daily. Massage lightly. Do not rinse. For best results, visit PHS Hair Science trained consultants for regular progress updates on scalp condition.